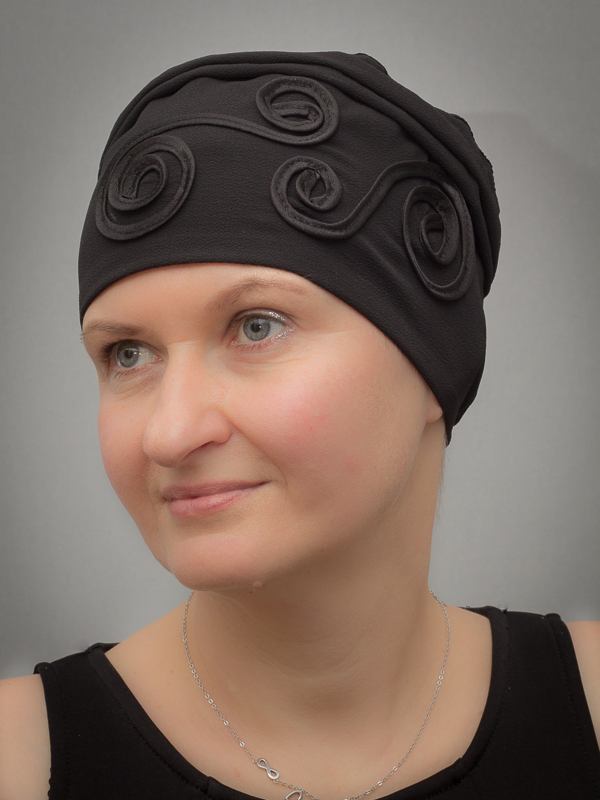 Today Zaneta Malkiewicz of cancer headwear business Hairless Beauty shares her astounding story of survival against the odds. My name is Janetta, I’m 40 and I live in Dublin with my husband Tom and our 8 year old son Simon. We have been living in Ireland for the last 14 years and are originally from Poland. In January 2015, I flew with my son who was four at the time to Poland to see my parents. As always, I went to see my dentist, my gynaecologist and to do a basic blood test. The gynaecology visit was supposed to be a routine one. In my mind it was about getting ready for another pregnancy. Before my son was born, I had two miscarriages and I just wanted my doctor to check if everything was ok. The gynaecologist found three cysts on my right ovary. My left one was badly damaged by previous endometriosis. Because of the sizes and location of the cysts, the doctor told me that I had to consider removing my right ovary. That was harrowing. It meant I wasn’t going to have another child. I went back home and cried all night. I couldn’t come to terms with not having a second child, that my son would be my only child. We always wanted two children. The next day brought even worse news… Two markers in my blood test were strongly elevated. This indicated a suspicion of ovarian cancer. I was advised to start acting on it immediately. I came back to Ireland after a week. The rollercoaster began. I visited two consultants. One, who helped me enormously with my previous problems with my left ovary, and one in St. James’s Hospital. Both doctors were rather reassuring that it was most likely another case of endometriosis. I had this before and it likes to come back. Unfortunately, CT and MRI scans revealed many areas of inflammation in my pelvic and abdominal areas. My doctor recommended a diagnostic laparoscopy during which he wanted to take biopsies. It took place on the 2nd of March in St. James’s Hospital. I was home the same day, but not for long. The results from the biopsies came back with crushing news. I had stage IIIC ovarian cancer. I needed to have extensive surgery. My doctor went through the details of it and it seemed so abstract. My whole world collapsed. My drama was that I wouldn’t be able to have more children – I didn’t even think that what we were starting to deal with was much more serious than not having a second child. Then, after returning to Ireland, everything was happening so fast that I didn’t even have time to think that it was cancer. My doctor’s drawings showed me where the cancer was and how the surgery would be performed. I also had a conversation with the stoma specialists – all of that was overwhelming. I thought it was just a dream… I didn’t understand what the doctors were even talking about… I remember thinking, are we talking about me? Ovarian cancer which had spread to most organs… Will I die? The plan was to undergo a de-bulking surgery as soon as possible, followed by six sessions of Carboplatin and Paclitaxel (Taxol) chemotherapy every 3 weeks plus Neulasta (a white blood cell booster) applied 24 hours after each chemotherapy session. The surgery took place on Friday the 13th of March. It took almost eight hours. Eight hours of cutting, scraping and removing the smallest bits of the disease from the majority of my internal organs. My uterus, my ovaries, my fallopian tubes, my gallbladder and appendix were removed. My bladder, liver and diaphragm were scraped of the disease. My bowel had to be cut in two places to remove bits which were too badly infected. My ribs had to be broken to gain better access to my liver. I lost so much blood that I needed two transfusions. Today I don’t remember the pain, but when I read my hospital files later on I couldn’t believe one person could actually survive such interference. It’s only now that I realise why everyone in the hospital was so attentive, why they were saying I was so brave and so strong. I stayed in hospital over two weeks. Two long weeks during which I went through hell. Countless tubes and probes coming in and out of my body. Tons of painkillers and panic, fear that it will begin to hurt again. I had an epidural, I had a morphine patch, I had a pump which was supplying a constant flow of morphine and also I had a remote which I could use every five minutes for an extra dose and I was getting painkillers intravenously as well. 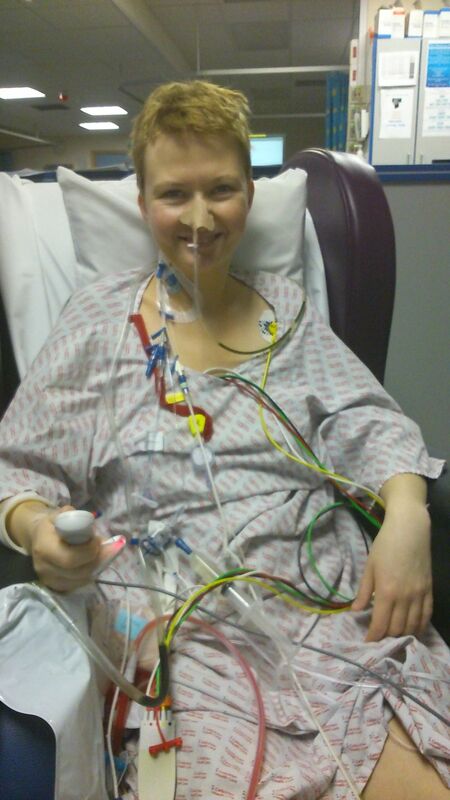 For the first week, I was relying on all the tubes but after a week they started to pull them out. I started to get up, take my first steps and first bites of food. Every move, every breath and bite were causing pain. My doctor was visiting me every day and was saying how well I was doing but I felt otherwise. At last, at the end of March I was brought home. The medicines I had to take made me see strange things, talk to myself and made me almost absent. Additionally they were causing bad constipation which was a big problem after my bowel was cut and stitched back together in two places. Every bowel movement was an agonising pain. I was given five weeks to rest and get better before chemo would begin. Although physically I was getting better and better, I was still in a lot of pain and mentally I was in bits. My oncologist decided to push chemo away for a further two weeks and sent me to a psychologist for a consultation. That was a breakthrough. I am very glad now that I went there. It helped me a lot, mainly in dealing with pain. I feel now I couldn’t have done without it. 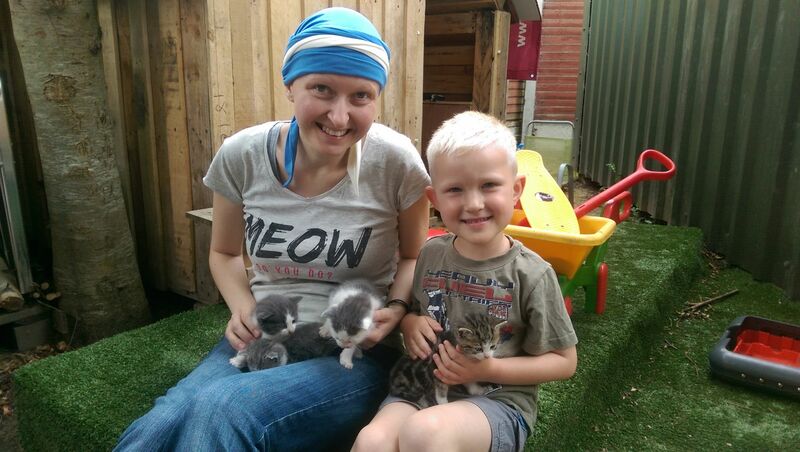 Before my chemo sessions, I was terrified. My mum had breast cancer 17 years ago (she is doing well, she is healthy and full of energy since then) and I remembered she had a really bad experience with it. She is a strong woman but the chemo made her very, very sick so I was scared that it would happen to me as well and I’d already had enough from the surgery. The sessions themselves weren’t actually that bad. The worst was the first week after. Within 24 hours after each chemo, my husband Tom had to give me an injection with a medicine which was supposed to stimulate my bone marrow to produce white blood cells to fight the cancer and any infections. The side effect of this was bone pain, bad bone pain, lasting about 6-7 days and always with the same progress. My hair started to fall out after the first chemo. I was really afraid of hair loss but once it started to fall out I just shaved it, looked into mirror, cried and accepted this – there was no point in worrying about something like this. 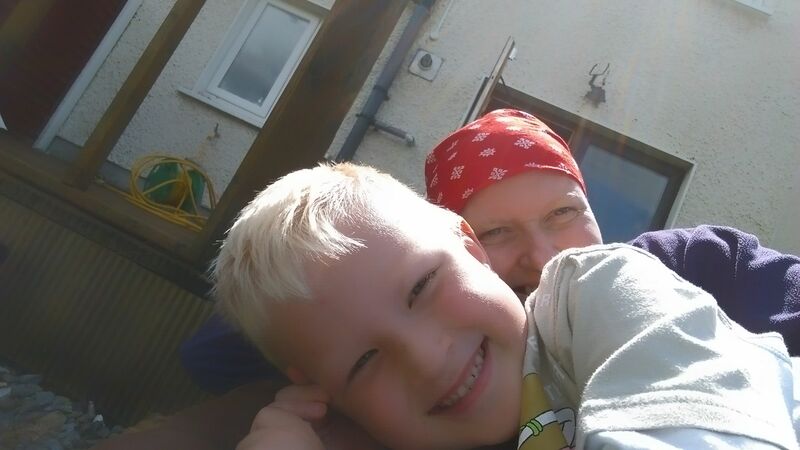 A bit worse was when my eyebrows and eyelashes fell out after the third chemo – but again, there was nothing I could do about it so there was no point in worrying again. And actually that’s how my journey with my small business, Hairless Beauty, started. I started to look for cancer headwear. I didn’t want a wig. I was looking for something comfortable, lightweight and stylish. I wanted my cancer headwear to turn me back into a woman. I was looking for scarves and turbans which would not be obviously cancer related. This got me thinking for the first time about starting my own business. I finished chemo in the beginning of September that year. I was still on loads of painkillers and tablets from my psychologist. After chemo I got all the possible side effects. I thought, “this is not a life I want to live”. My stomach was starting to give up, my body was weak, I developed bad neuropathy, bone pain and chemo brain. If I wasn’t under the care of my psychologist, I would not have made it. Cancer hit again. Within two weeks, I started to feel worse and worse and my oncologist confirmed that the cancer was back. I was devastated, it was only 12 months since my last chemo and because the cancer came back aggressively and very quickly I knew it wasn’t good. I felt I wouldn’t make it this time. The cancer was in my abdomen, in a few pockets of liquid which made me feel very bad. I started chemo again, Carboplatin and Caelyx, six sessions with a 4 week break between them. I didn’t lose my hair again, but believe me I would have begged for losing my hair instead of the other side effects I did get. This chemo was so much worse. It had to be rescheduled twice due to poor blood test results. In between the chemos, I was dealing with colds, flus and infections. After the fifth chemo, I didn’t even have the power to move my eyelids. That was first time I said I have had enough, I’m not going to take another chemo. I was literally done! Thank God, the doctor didn’t prescribe the sixth session. I finished treatment after the 5th chemo as my doctor said it would do much more harm than good to me. The time immediately after my surgery was probably the worst. The side effects of chemo were bad. Also as I am a very active person, I was upset that chemo was keeping me in bed with no energy, no power. It wasn’t like me. My son was 4.5 years old and I was sad and worried that my illness would affect him. He didn’t understand why his mummy was in bed most of the time, why she cried often and didn’t play as usual with him. Best part… I can’t think about anything… The only one thing that comes to mind is that in a difficult time, you discover who your real friends are. And illness can help bond a family and make it stronger. Another positive was all the treatment I received in hospital from both my nurses and doctors. My husband, my son and my parents. Get the professional mental health help. I wouldn’t have made it through without the help of the oncology psychiatrists in my hospital. They taught me to be good to myself and how to deal with cancer. “One day at a time” – that’s another advice. Before cancer, I was a very busy woman, very active, I wanted everything now, I was inpatient, efficient, I wanted to know everything right now, I didn’t like to wait, I was extremely well organised and was making plans for months ahead and I was constantly worrying about everything. I am not that person anymore, I had to slow down and take every day as it comes and I am happy with that now. I am BRCA1 gene mutation positive so after my first recurrence and a good response to platinum-based chemo, I qualified for getting the Parp Inhibitor drug called Olaparib or Lymparza. I was the lucky first in St. James’s Hospital to receive this drug. I have been taking it since April 2017, so 18 months now and all is good. I had a scan in September this year and all was stable – no progression of the disease. The starting dose of 800mg per day was reduced for me twice so I am now taking 300mg per day. Of course I am still worrying that this is a small dose so won’t be that effective, but it seems to be working well and I hope it will for many years. Olaparib gives a lot of side effects, some of them really bad and serious but I am doing quite well and I am so happy to have this drug. I once thought I was not able to fight. But I was fighting and I fought hard and I am happy to still be alive and be able to take part in my son’s life. I am extremely grateful for the excellent care and attention I received from the doctors and nurses in St. James’s Hospital. Cancer brought a lot of pain and suffering to me and to my family, but cancer has also made me a much, much stronger person. I now enjoy time on my own more often. I never thought about myself in the past. Work, more work, making my family, friends, etc happy. There was no “me” time. I really enjoy coffee on my own now in a coffee shop, a small shopping trip, reading a book, etc. After my diagnosis, I realised how fragile life is. It changed my way of thinking and the way I perceive this world. I have to live and I can’t be worrying about all the things I can do nothing about and I need to appreciate every day and all the small things in this world. I cry. That’s my way of dealing with the fear and stress of cancer. When it builds up, I just let my tears fall and I pity myself. It lasts for a few minutes and then I am ok for another few days or weeks. My small business helps as well. It keeps my mind occupied and my thoughts away from the past years. It’s quite exciting as well. I am selling cancer headwear. Scarves, hats and turbans which will hopefully help other women the way mine helped me. I speak a lot with my customers, giving them hope and sharing my experience. They really appreciate that which makes me happy and gives me a feeling that I am needed. 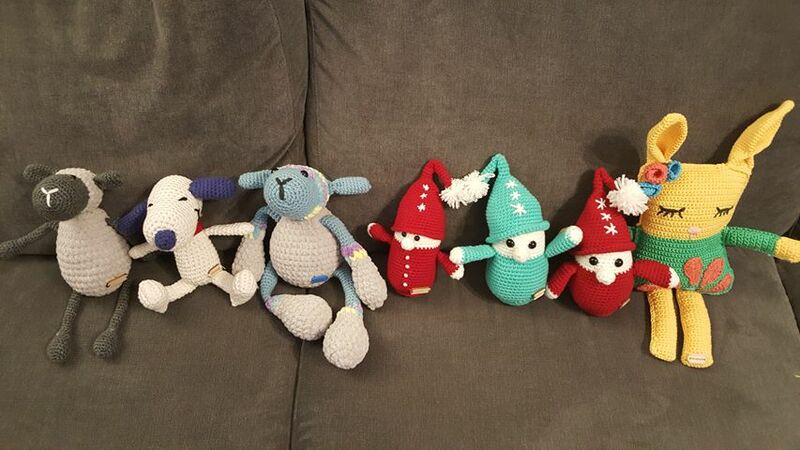 Also, my new hobby – crocheting – is very relaxing and helps me to switch off! Haha, it’s a cat 😉 He makes me smile, he follows my every steps, and he heats my lap, belly and spine. He is a great company to me and a great “little brother” to my son. His energy and curiosity brings us a lot of fun. He is a Devon Rex breed and it’s a cross of monkey, dog and a little devil! He is a great therapy for me. It’s hard to give good advice to someone who just has been diagnosed. I suppose, try not to think that this is the end of the world. Sleep, talk to your doctor. Write down any questions which come to your head and ask your doctor. Knowledge is power. But avoid Doctor Google! Diagnosis is a shock, but once you have a treatment plan in place you will feel relieved. And when the treatment starts, be good to yourself, take it easy, eat healthy, ask for help and take one day at a time. In my story here today, I have tried to be very precise and I have given a lot of details. This is not to scare anyone reading this, but rather to show you that my situation was really bad, but I fought and I am still here. Having a will to live is very important… so please don’t give up! Thank you so much Zaneta for sharing your story of survival with us.